The top guide to hiking within an hour’s drive of Portland, OregonThe best way to experience Portland is by hiking it! Get outdoors with local author and hiking expert Paul Gerald. Now in full color, his best-selling guide helps you locate and access the top hikes within 60 miles of the city. A perfect blend of popular routes and hidden gems, the selected trails transport you to scenic overlooks, mountain retreats, and magical forests that renew your spirit and recharge your body.Hike around Mount Hood on the Timberline Trail. See migrating fish in the Salmon River. Enjoy the wildflowers at Tom McCall Preserve in the Columbia River Gorge. Explore the wildlife sanctuary at Oaks Bottom, right in the heart of the city. Stroll behind waterfalls in Silver Falls State Park. Whale watch from high up on Cape Lookout. 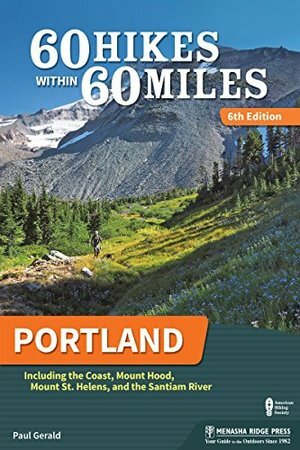 With Portland author and outdoors enthusiast Paul Gerald offering advice about where to hike and what to expect when you get there, you’ll learn about the area and experience nature through 60 of Portland’s best hikes!Each hike description features key at-a-glance information on distance, difficulty, scenery, traffic, hiking time, and more, so you can quickly and easily learn about each trail. Detailed directions, GPS-based trail maps, and elevation profiles help to ensure that you know where you are and where you’re going. Tips on nearby activities further enhance your enjoyment of every outing. So whether you’re a local looking for new places to explore or a visitor to the area, 60 Hikes Within 60 Miles: Portland provides plenty of options for a couple hours or a full day of adventure, all within about an hour from the city.